Dart Board Costing: Is your cost system precise or accurate? Does your cost system need to be precise? Probably not. Does it need to be accurate. Yes! What’s the difference? The four pictures above begin to provide an answer. Accurate costs are random but near the target. For example, I have a refrigerator with a thermostat that keeps it a constant 38.0F. I test it with a dollar store thermometer 10 times. The temp readings range from 37F to 39F. Therefore, my inexpensive measurement system is accurate …close to the 38.0F target … but lacks precision. Precise costs are repeatable but not necessarily accurate. Using the refrigerator example, an expensive scientific thermometer would have decimals and register precisely the exact same temperature during each of the 10 tests. The precise measure might be 36.05F after each of the 10 measurements or it could be precisely 38.05F each time. How could an expensive measurement system be consistently different? Not calibrating the measurement system before use is commonly the root cause. Precise implies accurate but that assumption is wrong. Precise systems are more expensive than accurate systems but often not what we need. Short answer is “To have a profitable business, you’ve got to match the accuracy of your cost system to your type of business“. Low Accuracy-Low Precision: If you’re the sole provider of a new product or service that delivers high value to customers, you don’t immediately need an accurate or precise cost system. Charge customers whatever price you want as long as net profits exceed 10%. 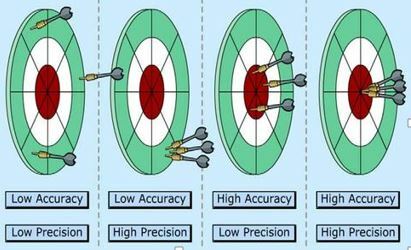 Low Accuracy-High Precision: If you have competitors with published prices, you need a precise cost system. A precise cost system, like Activity Based Costing (ABC), will consistently enable you to define, implement and measure continuous improvement to eliminate waste and compete. High Accuracy-Low Precision: If you Bid & Quote for new business, you need an accurate cost system. If your bid is based on inaccurate costs, one of two things will happen; (1) your batting average on bids will be low; or, (2) you’ll win unprofitable orders you wished you hadn’t won. High Accuracy-High Precision: If you compete in a market that has excess capacity, you’ll need a precise and accurate cost system. An Activity Based Cost system works well here because it measures Non-Value Added excess capacity. To take sales revenue from competition, you may want to price your product or service based on a highly accurate cost that excludes the precise expense of excess capacity. Barometric pressure is precisely useless information. It’s precise because it has two decimal points, e.g., 28.35. But to me it’s not accurate because I don’t know what the number implies, what I should do or what I should expect. If your choice of cost system has your head spinning like barometric pressure does to me, give me a shout. I’ll help you match your needs to the best costing method. Copyright © 2017 ICMS. Powered by JacsZen.